Our teachers can come to your school for P.E., and PPA, Enrichment, Dance for International days, & dance for themes covered in the curriculum. We also offer dance to bring groups of adults together for team-building, parties and performances. Please note most classes run during school term times and as such have the same holiday periods. ADULT CLASSES ARE ONGOING ALL YEAR! Click HERE to BOOK NOW for our 2019 classes! Who: Suitable for children 7-13 years, no experience necessary, beginners welcome! 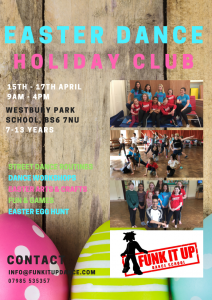 What: Fun & Games, Arts & Crafts, Drama, Street Dance Lessons and Choreography, Dance Workshops in other styles – Plus a small showcase for parents at the end of the 3rd day! £75 per child for the full 3 days! SUPER EARLY BIRD DISCOUNT! 10% Sibling discount available when booking! Plus our BEST OFFER YET…£130 if two friends/family come along together that are new to Funk It Up Dance!! Please email us at info@funkitupdance.com if you have any concerns or questions!